It’s not long now until VW unveil the latest version of its iconic Golf GTI at the Geneva Motor Show. The new GTI is powered by a turbocharged direct-injection petrol engine with the standard version accelerating to 62 mph in 6.5 seconds. Its top speed is 152mph. 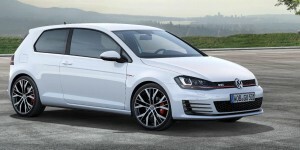 The GTI Performance just nudges ahead with a top speed of 155mph and will reach 0-62mph in 6.4 seconds for the sprint. The letters ‘GTI’ have stood for superior dynamic performance for over three decades now and it looks like the new model is going to be worthy successor to the name. For the first time, the legendary compact sports car is available from the factory with two power levels: the standard 220 PS GTI and the GTI Performance with 230 PS, larger brake discs and a front limited-slip differential (VAQ). Both versions are equipped with a Stop/Start system and fulfil the EU-6 emissions standard that takes effect in 2014. There’s a six-speed manual gearbox and they are fairly frugal fuel-wise, returning around 47 mpg. VW are enhancing the GTI’s sporty character painting its brake callipers red. There’s also 17-inch alloy wheels with 225/45 size tyres (though it looks as though 18-inch alloys will be standard in the UK), special side sills, a rear diffuser and smoked LED rear lights, along with LED number plate illumination. UK specification will also include bi-xenon headlights with LED daytime running lights. Interior highlights include sports seats with the classic tartan cloth upholstery, black roof lining and red ambience lighting. GTI drivers will also appreciate the bespoke sports steering wheel, gear lever and instrument cluster, trim strips and stainless steel pedal caps. VW is opening its Golf GTI order books for UK buyers on 26 March, with the first deliveries due in June. UK pricing and detailed specifications are yet to be confirmed. This entry was posted in Car Updates & Releases, Family Car, New Cars, Small Car, Sports Car and tagged alloy wheels, car, EU, Geneva Motor Show, Golf GTi, GTI, LED, LS, MoT, number plate, seat, speed, Sport, sports car, steering wheel, Stop Start, UK, Volkswagen, Volkswagen Golf GTI, VW by Steve Lumley. Bookmark the permalink.